Deployment is hard on the whole family. Many times, we focus on the trials military spouses face while their servicemembers are deployed. However, children also face their own challenges when a parent is deployed. When I asked seasoned spouses how their kids cope with deployment, they said that their child’s attitude depended greatly on their own. Unfortunately, we cannot be expected to have it together at all times. We have to cope, too, and as much as we shield our children from the stress we encounter, we cannot possibly screen it all. This is why there are programs designed to help your children, and you, cope with deployment. 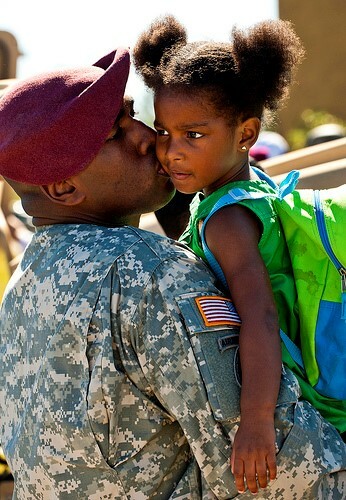 Military OneSource was established to help military families in all stages of their servicemember’s career. It is a confidential Department of Defense-funded program. They know how hard deployment is on military families, so they've linked up with programs like Military Kids Connect to help your little ones cope. Do you know all that they offer? Military Kids Connect offers interactional programs for kids, tweens, and teens and advice for parents. Personal Stories where you can choose from a variety of media to hear testimonies from other children with a deployed parent. Where Are You Going lets kids explore where their parent is living. From this window, they can learn about the geographical location, clothing, food, language, music, sports and games, and even arts and crafts of the country where their parent is deployed. Deployment Daily where kids offer other kids advice on coping before the parent leaves, while they are gone, and after they get back. If you're a military family dealing with a deployed spouse/parent, I hope you'll use the resources allotted to us to help ourselves and our children handle deployment with a healthy attitude. Military OneSource and Military Kids Connect do not pretend that deployment will not be a difficult time. They simply provide us with outlets for our children to resist isolation and be comforted that other children have the same thoughts and concerns. If you have yet to utilize Military OneSource, I encourage you to take a look at the resources they provide. They offer incredible tools, not only for spouses coping with deployment, but also moving, loss, financial, legal, employment, and education. After all, it is a DoD site that was created for us based upon need, and may not always be available if we don’t continue to use it to its fullest.